The default system assumes all actors gain the same amount of base exp from the troop, and does not provide any support for additional exp modifiers such as level difference. This script changes the exp gained from battle to consider each actor separately, and provides core functionality for any scripts that would like to define new exp modifiers. 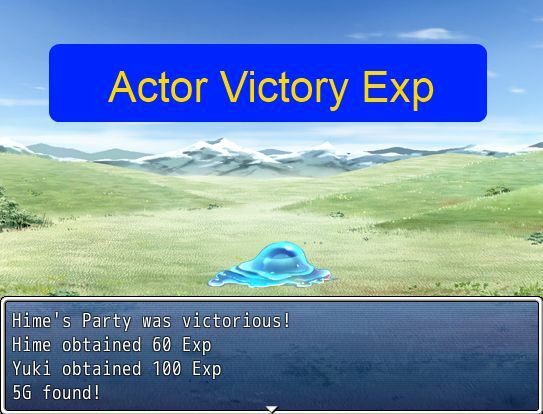 Exp in this system is still rewarded the same way: each actor receives the same “base exp”, which is the exp value that you set for the enemy in the database. Exp modifiers are then applied to this “base exp”, resulting in the final exp that will be displayed on the screen. Note that the “exr” feature is calculated as an exp modifier as well, so the value you see on the screen is the total exp your actors receive. In the configuration, you can choose how you want the message to be displayed.